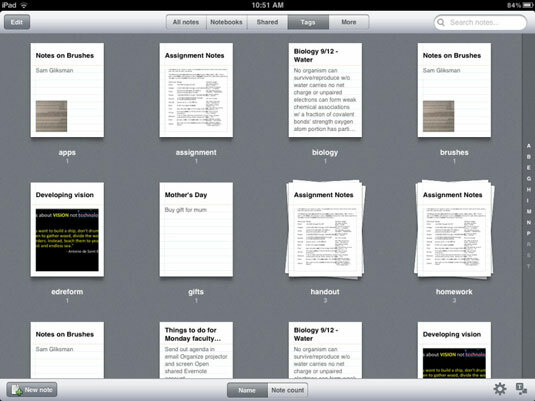 Use Evernote iPad app to store text, audio, photos, and other digital content. Search your Evernote notes to locate stored information. 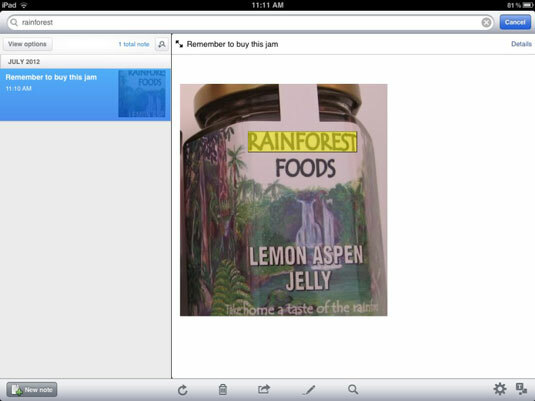 Evernote iPad app allows you to create information for your students, and to accept information from them as well. There are many ways to search your Evernote content. The more you start saving content, the more you’ll want to become proficient in different ways of finding what you need. Here are a few methods to try. Browse by notebook. Tap Notebooks on the top menu bar of the iPad app, and each notebook is presented as a stack of notes. Tap any stack to browse the notes in that notebook. Browse by tags. If you were diligent about adding accurate tags every time you saved a note, this is a breeze. Simply tap Tags in the top menu bar of your iPad app, and Evernote sorts all your notes by tag. Tap the stack with the tag you want and then browse the notes. Use the Search box. Type a search term in the Search field, and Evernote searches through the text of all your notes and presents a list of results. It even searches for text in any images you’ve saved in notes. Suppose that you visited Gettysburg and snapped several photos to use in your history class. Search for the word, Gettysburg, and Evernote will display the photos. If you took a photo of some jam you tried at a friend’s house and then searched for the word jam. Evernote would find that photo instead. Assuming that you have an Internet connection, if you saved a note using an iPad, iPhone, or any other device with GPS services enabled, Evernote knows where you were when you created the note. Open a note in the viewer, and tap Details in the top-right corner. You’ll see a map at the bottom of the Details menu, which you can tap to zero in on the exact location associated with the note.